Living in a tourist city like Las Vegas is a special and unique experience. Many people make your city a destination to get away and vacation. Even more so, if your friends come in town to explore, chances are they want to meet up and have you tag along while they walked miles upon miles up and down The Strip—the same song and dance you did so, so long ago during your first time Vegas experience. While there are plenty of activities to do on the Strip, all locals know the traffic and costs can be a little too much to stress about. You don’t want to feel like a sheep being herded through crowds of drones, going from one casino to the next, not to mention spending around $30 on cocktails. So, the next time one of your out-of-town friend asks what you recommend, you can take them to the local hotspot—Downtown Las Vegas. Whether this your friend’s first time in Las Vegas or if they have been here before, Downtown Las Vegas offers a unique experience for locals and tourists. One way to explore the streets of DTLV in a unique way is by hopping on a bar crawl with Vegas Pub Crawler. But before you hit up the Pub Crawler, here are some things you can do. The Mob Museum is a historical area in and of itself. It’s located within the original DTLV courthouse where many mobsters were convicted. Now, its DTLV location is all about educating us on the crazy one-of-a-kind history that could only exist in Las Vegas. Teach those who are new to Vegas what the city’s history means to the locals. Fremont Street is full of unique and exciting things you’ll find absolutely nowhere else. Seriously, where else will you find an LED sky you can soar down on the SlotZilla Zip Line? The Fremont Street Experience also offers different art, local bars, and musical performances from big names—pretty often, too. You’ll also find a light show every hour from 6 p.m. until 1 a.m. Talk about a late night! But it’s Vegas, and your outsider friends will greatly enjoy this much more than The Strip, if they give it a chance. Like the Mob Museum, the Neon Museum represents an iconic image in Las Vegas history: the famous bright lights people say you can see from space. If you’ve ever wondered what happened to all those old lights, statues, and signs from the old Vegas, your answer lies here. It’s possible your friends from out of town haven’t been here in a while or not at all. And hey, still think the Aladdin or the Desert Inn are still up? Well, take a tour of the “casino graveyard” at the Neon Museum, and you’ll see what’s left of them. It is DTLV’s newest shopping district, and it’s perfect for a first time Vegas experience. Made entirely out of recycled shipping containers, Container Park has everything: bars, stores, playgrounds, and its own unique movie theater. Your friend from out of town will be fascinated by the how different, yet clever, this little slice of Downtown Las Vegas is. Downtown Las Vegas is constantly changing and new experiences are always coming up. Be sure to keep an eye out for future DTLV additions. 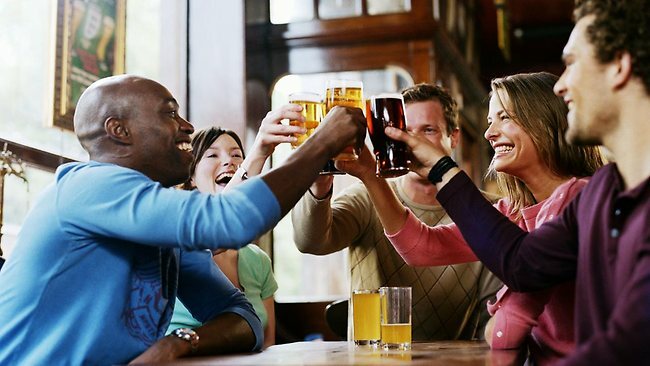 Taking a pub crawl in Las Vegas is the perfect first time DTLV experience, as there are plenty of places to take your friends. So, take their first time Vegas experience over to some DTLV bars and have a party they won’t forget.